Summer is almost here, and school winds up soon. That often means the kids are home and looking for snacks. Why not make some delicious and nutritious snacks WITH your kids? 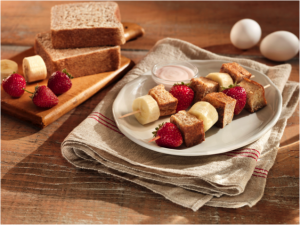 Here are 6 tasty ideas you make with your kids – you can even have them help you pick out the ingredients at the store! Ask kids that are old enough to safely use a knife to cut pieces of apricot, peaches, plums, mangos, melon or other whole fruit such as strawberries or grapes. For younger children – help them use a knife or provide a bowl of diced fruit to skewer. Set out wooden or metal skewers and let them assemble. Slice cucumbers in rounds, slice Swiss or cheddar cheese and sandwich bread into square sizes similar in size to the cucumber wedge. Provide kids with wooden or metal skewers and let them assemble. Skewer cherry/grape tomatoes with mini bocconcini cheese balls and cooked tortellini on wooden or metal skewers and brush with pesto. Blend fresh berries or mango and vanilla yogurt in a food processor or blender along with a bit of milk or unsweetened juice (just enough so the mixture blends). Pour into popsicle molds and freeze. Blend fresh, frozen or canned unsweetened pineapple with coconut milk and a sprinkle of shredded coconut in a food processor or blender. 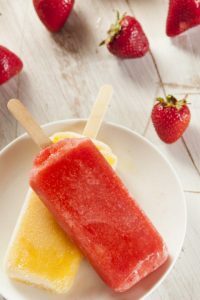 Pour into popsicle molds and freeze. Insert a popsicle stick on a wedge of watermelon, cantaloupe or melon and serve as is. Alternatively skewer grapes or blueberries on a wooden skewer to create a caterpillar (use cream cheese to stick on mini chocolate chips or raisins for eyes) and serve either fresh or frozen. Looking for other ideas to feed your family this summer? Trying to get more healthy options into your children? Consider a nutritional counselling program at Health Stand Nutrition.